The second son of Bonnie William and Margaret was Frederick Langloh Wilson born 1823 in Richmond, Van Diemen’s Land. Frederick was named after a close friend Frederick Langloh who with his wife Mary accompanied William & Margaret on the voyage from Scotland in the ship Skelton in 1820. Frederick married Jane Stevens in O’Brien’s Bridge in 1856. Jane’s family were natives of England, Jane being born in Hobart in 1823. They appear to have been a well to do family judging by the fact that Jane (and possibly her siblings) were sent back to England for a classical education, which included languages and music; the family holds letters, written by Jane in French, back to her family in Tasmania. Jane was also a competent musician and composed several musical pieces still held by arms of the Tasmanian family. Frederick and Jane had their six children in VDL and remained in that colony raising the family and farming; Frederick’s two brothers and their families around 1857 moving to the Colony of Victoria. After the death of William in 1856, Margaret successively resided with Frederick and his family at three farming properties, O’Brien’s Bridge, Prosser’s Plains (Buckland today), and finally at Mount Nassau near Granton. A downloadable pdf three generation chart of Frederick and Jane’s family is shown below. An image of Frederick and Jane is shown above, that of Frederick, a water colour painting estimated to have been made when he was in his early thirties, that of Jane in her early forties is a photograph set in an oval backing, a style which came into use from about 1870. 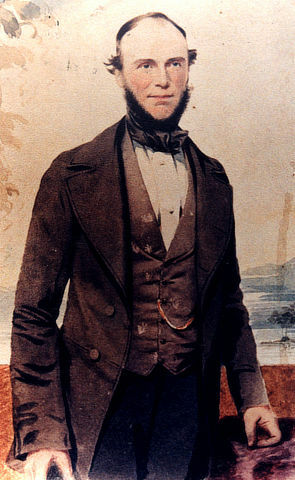 Frederick’s image is believed by his Tasmanian descendants to have been painted in water colour by his father William who was known by them to have been a quite accomplished water colour artist. The colour version of that image is shown below – click on it to enlarge.